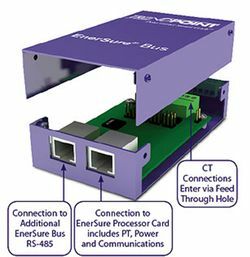 The EnerSure® bus system is the ideal monitoring solution for existing or new busway power distribution systems. To achieve this, the bus monitoring units are attached to the plug-in box of the busbar and the metering unit connected to the phases. 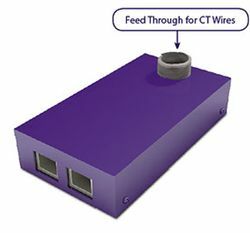 Volts, amps, power factor, watts, kW and kWh are all recorded at circuit level In total, up to 30 bus monitoring modules can be attached to a corresponding number of plug-in boxes per busbar run or cabinet row and connected to one another via serial connections to form a comprehensive power metering system. The data recorded at the plug-in boxes can be stored locally and downloaded as a CSV file. Or it can be bundled and transferred via TCP, Modbus, SNMP or BACnetIP connections to comprehensive monitoring or building management applications where it is centrally analysed and evaluated. No additional hardware or gateway is needed for data transfer. The EnerSure® bus monitoring solution supports current transformers between 75 and 4,000A, compatible busbars in the country-specific, low-voltage networks and monitors the parameters of 1-, 2- or 3-pole circuits with one and the same board. No gateway or additional hardware necessary.